Having low expectations exceeded is always preferable to high expectations not being met. With all the hype surrounding Triumph’s Bonneville Thruxton reboot, I attended the press launch under the premise of the Thruxton being a stylized Bonneville racer lacking the performance for which it’s namesake implies. How surprised was I to discover that a traction-control system was the only thing keeping the fuel tank from smacking me in the chest when grabbing a fistful of throttle for the first time. 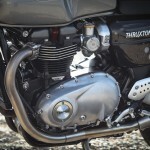 The “High Power” parallel-Twin of the Thruxton is outwardly nearly identical to the “High-Torque” version of the T120 Bonneville. 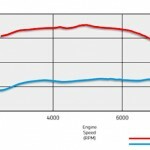 The Thruxton actually delivers more torque as well as more horsepower than the Bonnie’s Twin, but the T120 gets to the fat of its torque curve much lower in the rev range, hence its “High-Torque” tagline. Although, curve really isn’t the correct descriptor. 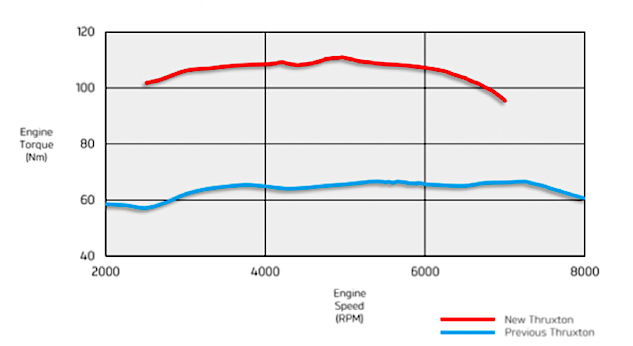 Torque plane better describes the chart Triumph revealed, showing an immediate spike to 80 lb-ft just a tick over idle, peaking at 4,950 rpm then gradually tapering off, but maintaining 80-ish lb-ft throughout the rev range. 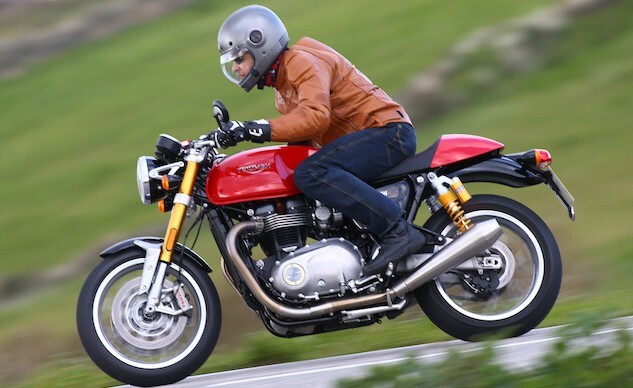 Internally, the Thruxton’s Twin is endowed with a “low inertia” (less flywheel) crank allowing its Twin to spin to its redline – which is 500 rpm higher than the Bonneville’s Twin – quicker than its less racy counterpart. In true sportbike fashion, the Thruxton’s Twin is eager to gain revs, powering out of corners with surprising ferocity. TC is an electronic aid you’ll be glad is present as the Thruxton can easily overpower its 160/60-17 Pirelli Diablo Rosso Corsa rear. But if you’re feeling especially frisky, TC can be switched off, as can ABS. Triumph is claiming 96.5 crank horsepower, which should result somewhere in the mid 80s at the rear wheel, but don’t let the figure fool you. It’s the engine’s wall of torque making the rush of forward acceleration so breathtaking. From the Triumph-supplied dyno chart, we see that a claimed peak of 112 newton meters converts to 82.6 lb-ft of torque @ 4,950 rpm. More important than peak torque is the constant production of torque throughout the rev range, and the much greater production of torque over the previous Thruxton. Triumph claims 96.7 crank hp @ 6,750 rpm. The low-rpm torque availability makes for an easy-to-ride motorcycle that keeps shifting to a minimum and throttle play at a maximum. There does exist some slight off-to-on throttle abruptness, but it isn’t as apparent on the Thruxton as it is on the Bonneville. Riding the Thruxton aggressively is made easier by the addition of a torque-assist clutch which provides two benefits: making clutch pull extremely light, and reducing the engine braking effect you’d expect of a Twin of this displacement and torque output. 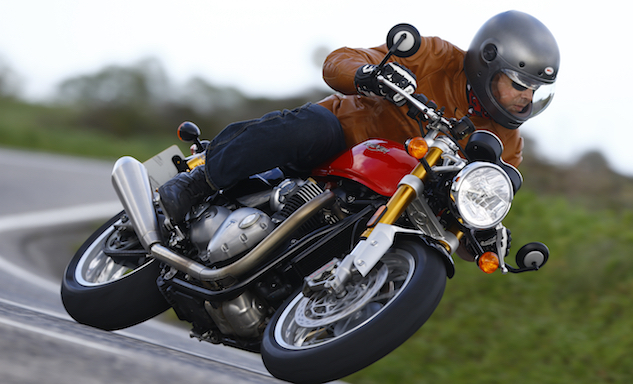 There’s more to the new Thruxton than just a rev-hungry, torque-monster engine. 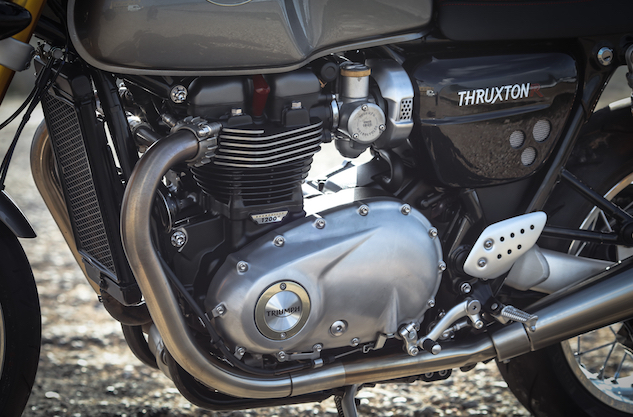 A shorter swingarm and steeper rake (22.8º) reduce the Thruxton’s wheelbase by 1.2 inches compared to the Bonneville, while lightweight aluminum wheels reduce unsprung rotating weight. The resulting chassis equals the performance of the engine in terms of cornering eagerness that’s flickable in tight transitions while remaining stable through fast sweepers. Any flexiness at aggressive road speeds has been engineered out of the new frame, leaving the Thruxton a pure joy to ride quickly through the canyons. Wide clip-ons provide their own form of torque, allowing a rider to quickly transition the Thruxton from one direction to another. 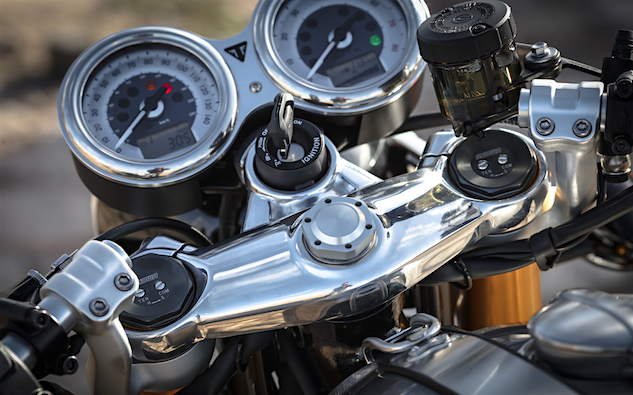 The Thruxton willingly complies to rider inputs with quick but neutral steering. The rise of the clip-ons from their mounting position beneath the top triple tree allows for just enough forward lean to weight the front end and feel the feedback from the front tire and suspension without being ridiculously uncomfortable for a cafe racer street bike. The seat-to-pegs relationship is sporty with cornering clearance a-plenty for street riding, but, like the clip-ons, the peg positioning isn’t severe enough to be a complaint for all-day riding comfort. The seat is supportively padded, too, but there is a small problem in the seating position. The tank cutouts are more form over function, as I, as well as other journos at the launch, discovered that where the inside of your knee naturally wants to rest falls directly against the edge of the bottom of the cutout. The result, an annoyingly uncomfortable position for a rider’s knee to be in that worsens as the day gets long. Switchable TC and ABS aren’t the only electronics gracing the Thruxton’s digital repertoire. Three riding modes – Rain, Road, Sport – change the character of the engine’s power output by reducing or increasing throttle response, while not neutering available power. Switching power modes can be done on the fly via the left handlebar switch. Ride mode, TC, ABS and all the regular information you’d expect to find are located in the twin clocks with beveled analog readouts for speed and rpm, while digital windows inside each also provide information including gear position, dual tripmeters, and average fuel economy. Twin 3D clocks combine analog and digital information. Note the polished triple tree, fully adjustable Big Piston Showa 43mm fork, tank strap, and polished aluminum Manx-type fuel cap cover. 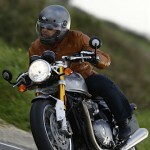 Our time riding the Thruxton through the outskirts of Lisbon was spent aboard the upscale R model. 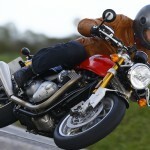 The $14,500 top-of-line Thruxton is $2k more than its standard counterpart and earns its loftier price tag largely by wearing twin Öhlins fully adjustable shocks, a fully adjustable Showa Big Piston fork, and Brembo monoblock calipers. In this guise, the Thruxton R shines the brightest, but without riding the standard model it’s difficult to determine, other than by virtue of their brand names, how much the high-spec performance parts up the Thruxton R’s game. For performance-minded riders, I’d be willing to bet that the upgrades are worth the extra the expense, and that a lot of the riders eyeballing these bikes can also easily justify the upgrade. Or, maybe, saving the money isn’t such a bad idea because one accessory, in particular, would be added to the Thruxton I’d purchase before leaving the dealership. After having seen the Thruxton with its accessory fairing installed, I wouldn’t want to live without it. The craftsmanship of the fairing is excellent and enhances the Thruxton’s profile to the image in my mind of what a modern-day iteration of a vintage racebike should be. Triumph’s developed many accessories for the Thruxton – including a Performance Race Kit – that transforms the Thruxton from a street-legal vintage canyon strafer to a full-on retro trackday weapon. The radiator of the new liquid-cooled 1200cc Twin is barely more apparent than the oil cooler on the outgoing model. The engine compartment is tidy without any external plumbing uglifying its profile. The faux carburetors of the new EFI look the vintage part. The evap canister is there; can you find it? As great as the Thruxton’s new levels of performance are, Triumph deserves high-praise for the time and effort spent on every detail, large and small. From the brushed aluminum Manx-style filler cap cover (which hides the actual locking fuel cap beneath it) to the polished aluminum triple clamp, Triumph engineers left no stone unturned in their quest to construct a modern iteration of a classic style that existed long before modern technology arrived to uglify unfaired bikes. From the simple task of hiding the rear brake master cylinder behind a stylish engine cover, to the more difficult task of locating the coolant reservoir in the shadow of the transmission, the new liquid-cooled Twin does an exceptionally good job of emulating the air-cooled engine of yore that inspired the new bike’s design. To meet stringent Euro 4 emissions, Triumph craftily disguised the throttle bodies as carburetors that look the part from just about any distance. There’s also an evap canister installed, but I’ll bet most riders will be unable to find it. 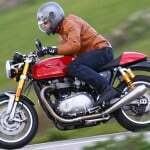 According to Triumph, Thruxtons and Thruxton Rs are already sold out through July of this year. If this trend continues, taking a test ride could prove to be problematic. This type of response to an unproven new model isn’t unprecedented, but it is rare for a bike that’s not a numbered, limited-production model such as a Ducati Superleggera. Great for Triumph but not so much for the motorcycling public. Because, if you like what you see in the photos, you’re gonna love what you see in-person. 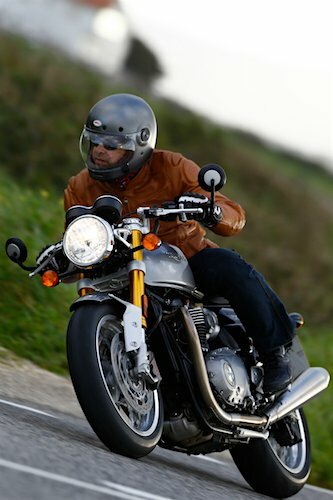 And if you do get a chance to take a test ride, have your deposit ready because you might not want to climb off the Thruxton until it’s parked inside your garage. An ear-pleasing sound emanates from the dual upswept reverse cone mufflers. Too bad Triumph couldn’t have budgeted for removing the unsightly tank seam. 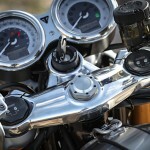 Get price quotes for Triumph Bonneville from local motorcycle dealers.